Outdoor fire pits add an inviting glow during chilly winter evenings and warm summer nights. With one of our outdoor fire pits in your landscape, you can make your backyard a natural gathering point for entertainment, socialisation and relaxation. A well-blended outdoor fire pit can enhance the beauty of your outdoor living area. At Landscapes WA, we can design outdoor fires that you can not only enjoy while outside but also can be easily seen from inside of the house. Want to roast marshmallows in your backyard? Want to enjoy a warm cup of coffee on a cold evening out in the open? Perhaps some story-telling or laughter by the fire with old good old friends? Landscapes WA gives you different options for outdoor fires from which you can choose to enhance your outdoor aesthetics. Our outdoor fire options are available in different designs and shapes to complement the architecture of your property in Perth, Western Australia. Outdoor fire features can enhance the look of your outdoor landscape design and is not limited to outdoor fireplace. 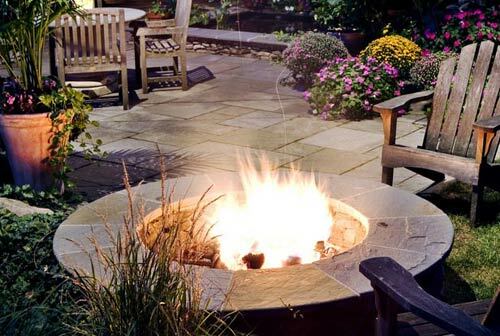 At Landscapes WA, we provide our clients with a wide variety of outdoor fire options. Fire pits are quite popular as they provide a centre point for gathering around. These can either be wood burning pits or include connections for natural gas or propane. 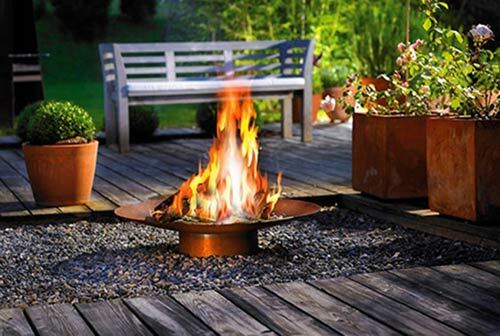 Fire pots are smaller versions of fire pits that can be placed in pots on stone columns or around the patio on the ground. These add elegance to the backyard and can even be filled with water, lava rock or ceramic logs. Similar to indoor fireplaces but built with stone and customised accents, outdoor fireplaces are placed at the edge of the fireplace at the centre. Fire channels are mesmerising fire displays in a straight line for a great outdoor ambiance. Spread fire spots around the backyard with tiki fire torches, available in oil-filled or gas versions. Whether you want to simple gaze at the fire and meditate or have a cozy natural gathering place for your friends and family, we provide you with stone, block and cap, or brick veneer outdoor fires. Call us today!